It’s been another Sunday of crafting here at Monica Wants It HQ, and I love today’s project. I was rushing against the clock because I wanted to participate in a blog hop hosted by the lovely folks from HomeTalk.com and CountryLiving.com. 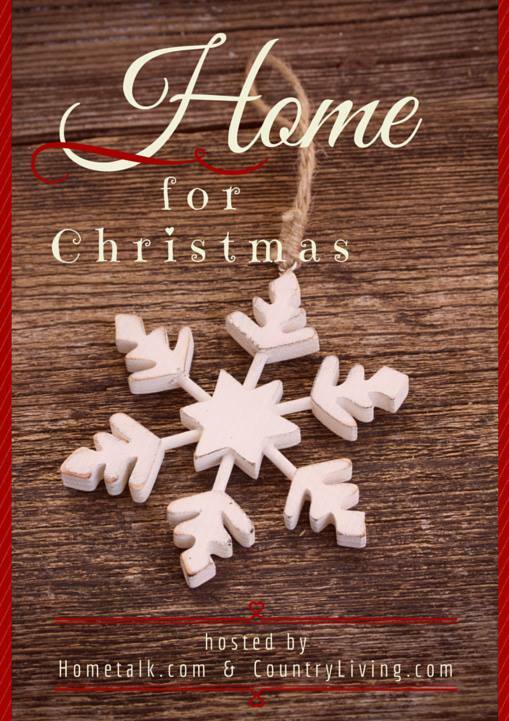 I encourage you to stop by and see all of the other blogs that are linking up (see the end of my post) and track the #HomeForChristmas hashtag across social media. A year ago I bought this laminator with hopes of trying to do some DIY foil art, and I just never got to it. But, I am actively making more time for myself and got to craft all afternoon today while my hubby watched football. Once I got going I realized I needed something pretty to hold my DIY foil art, so I whipped up some glittered clipboards inspired by a similar one that Heidi Swapp showcased on her Instagram. They’re so sparkly and fabulous. Let me warn you though- the glitter does come off rather easily, so this is more for form than function, KWIM? Looking back I would have used a finer glitter, but I’m cool with how it turned out. Let’s do this. For the clipboard, I used your regular $1 store variety and covered it in some damask contact paper I had leftover from lining the drawers of my office console table. From there, I moved onto adding glitter. I used a combo of chunky gold glitter and a dash of Martha Stewart’s sterling glitter. It’s silver and has an iridescent finish. I mixed the glitters together in a small bowl. Using my fave quick dry glue from Elmer’s, I worked in small sections to glitter it up! If there were bare spots, I dabbed on more glue and glitter until I was satisfied. As the glue states- it is QUICK dry- you’ve got to work fast and in sections. I set those to dry and moved onto my DIY foil artwork dreams. Now, the great thing about this tutorial is that you can whip up ANY phrase your little heart desires in nearly any color you can imagine. I bought two of these little Deco Foil sheets on clearance at Michael’s for about $1 each, but Amazon has the same sheets in boat loads of colors (such as rose gold and silver). For example, you can get 20 gold sheets for about $8.50. That’s cheaper than what I paid per sheet. Yes, I already ordered some. 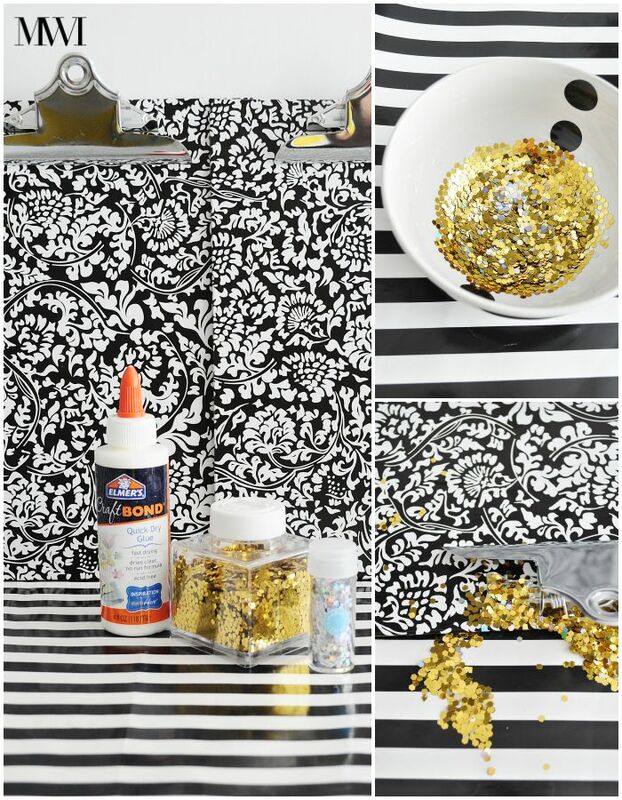 Once you see how easy this is, you’re going to want to foil all the things! You can use this for gift tags, typography art, greeting cards, ornaments, invitations…so many options. Step 1: Turn on your laminator and heat up to the warmest setting. I set mine on the 5 mil setting since I was using cardstock. Step 2: Take your print (you can download the one I made here for free…yay!) and cut a Deco Foil sheet to size to cover up all the parts you want foiled. The color side is facing UP, so on my project the gold was facing upwards. Step 3: Once your laminator is ready (on mine the “ready” light is blue), slide your cardstock with foil face up through the machine. Wait for it to slide through your laminator. Step 4: Carefully peel off the foil to reveal your DIY foil art. Now, I am not going to lie and say my foil print is perfect, but for about $1, I will take it. This was my very first attempt at this, but it won’t be my last. I love how shiny it is, and it brightens up my office area with some holiday cheer. On the other clipboard I put up one of Pee Wee’s cute holiday cards. And yes, I rearranged my home office. I’ll share those details soon, but here’s how my office originally looked if you want to check it out. And another angle. It’s hard to photograph foil, true story. And that’s all there is to it. 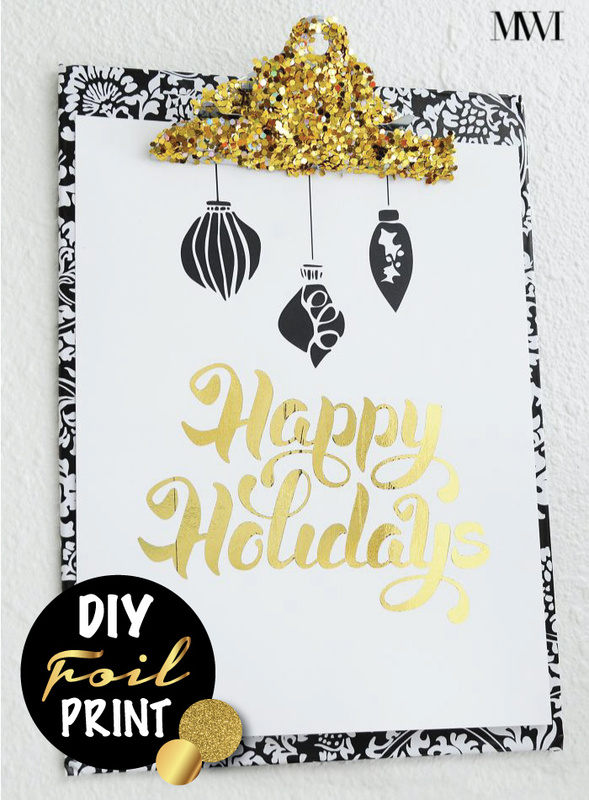 I love the festive holiday cheer it adds to my office, and I am glad I finally took the plunge and tried out this DIY foil art method. There’s plenty more inspiration via the #HomeforChristmas blog hop, so check out more DIY’s and decor for the holidays below. Be back soon with a MWI gift guide featuring hot techie and lifestyle gifts all under $25. SUPER CUTE!! I want to make a bunch of clipboards to hang in my office now! Glam and classy! woah! I love it! Wow… now that is the most glam clipboard I've ever laid eyes on. It's stunning! Thanks so much for the kind words and the pin, Marie! Foil Art is always so beautiful. Thanks for showing us a great way to decorate with foiling using a laminator. I agree- foil art is always beautiful and in style! xo. So classy and beautiful! I really need to spruce up my office, and something like this would be perfect…I love it!